The readers of this magazine should become LEADERS! Do you have the capacity to inspire — to influence — to lead others for good? Here are vital KEYS to building a powerful and effective personality — and to making your life more abundant! SOME twenty years ago, my boss ordered me and a partner to make a long and grueling trip back to the head office — immediately! We were already tired and sleepy from the long and difficult road trip we had been making. But now, just when we hoped to slow down and rest a while, we were ordered to drive over a thousand miles within the next thirty-six hours. An important meeting was to be held, and we were to be there. All the way back, I became more conscious than ever of how tired we really were. As we groggily rolled over plain and desert, I began to feel more and more sorry for myself. Sure, he wanted us back for an important meeting — and I should have been flattered that he did — but all I could think about was how tired I felt, and how he had insisted that we start back "immediately." "Doesn't he know how tired we are?" I muttered to myself. "Can't he realize that an extra day or two wouldn't make all that much difference — besides, we're so tired we might get in a wreck and be KILLED!" I thought. Exhausted, sweaty and with tousled hair and two nights' growth of beard from our long "straight-through" drive, we stalked into the building to check in and to find out when and where the meeting was to be held that afternoon. I walked a little stiffly, with set jaw and a chip on my shoulder. They said the boss was coming, so we waited for a few minutes in the hallway. Soon we heard him coming around the corner. "Hi, fellows!" the familiar voice boomed out with resounding warmth and enthusiasm. "BOY! It's good to see you guys here!" He gripped my hand warmly and put another friendly hand on my shoulder. "I know you're tired, but you look great. This meeting would just not have been the same without you fellows being here. Say, I really appreciate your driving straight through the night to get here in time! I think I'll line up a long weekend recuperation period over at a very special resort I know about as soon as this meeting is over. It'll all be on me. How about it?" "Oh, that's all right, sir," I found myself saying, "It wasn't so bad a trip, and we're sure glad to be back here on the job again." The warmth in his voice and his smile, the sincere love and concern in his eyes and manner — it melted me like butter out under a tropical sun! "Yes, me," I thought to myself later as I was alternately puzzled and glad at the sudden, unforeseen shift in my entire mood upon encountering the boss. For — as a former Golden Gloves boxing champion — I had thought I was "tough." What changed my attitude SO VIOLENTLY — so suddenly? It was simply the force of a sincere, dynamic and powerful PERSONALITY. It was the boss's personality. And, as I have realized more with each passing year, that personality is at least one of the important reasons why he became the "boss" over a large and growing organization! Now, what about YOU? Do you know the "keys" or the building blocks so that you can build this kind of personality? A new age is coming. And the right kind of LEADERS are going to be needed. Those who have proved the Word of God — who know that the Bible says what it means, and means what it says — realize that Christians are now in training to be those leaders. Notice Revelation 2:26-27: "And he that overcometh, and keepeth my works unto the end, to him will I give power over the nations: And he shall RULE them with a rod of iron...."
Again: "To him that overcometh will I grant to sit with me in my throne, even as I also overcame, and am set down with my Father in his throne" (Rev. 3:21). And Jesus directly promised the twelve apostles: "I appoint unto you a kingdom, as my Father hath appointed unto me; that ye may eat and drink at my table in my kingdom, and sit on thrones judging [RULING) the twelve tribes of Israel" (Luke 22:29-30). But in the World Tomorrow, as today, you can either lead people, or you can DRIVE them. You can cause them to want to follow you, or you can MAKE them. Here are those "keys" Jesus had — five of them — to help build a powerful personality — the personality of a KING. What is the thing that strikes you most about someone who easily wins your love and respect? Chances are, it is the sincere warmth and affection he shows. It may be the light in his eyes or his smile. It will often include the pleasant, friendly sound of his voice. For people who possess a great deal of personal charm really like their fellow human beings and are genuinely interested in them. Learning to love and enjoy others — to GIVE of yourself to them in personal relations — is certainly the foremost key to building a radiant personality. Jesus Christ — the greatest personality of all times — stated this universally applicable spiritual principle: "It is more blessed to GIVE than to receive" (Acts 20:35). If you can sincerely learn to share your warmth, your love, your plans, hopes and dreams with others — to give kindness, encouragement and a sense of being loved and appreciated to them — you will build bonds of friendship that will endure many a trial. And you yourself will be the one most blessed in the end. All of us should learn to SMILE more! We should put more warmth and enthusiasm in our voices and in our handshakes. We should build a sincere feeling of empathy or "at-oneness" with our fellowmen — having THEIR welfare and THEIR happiness at heart as much as our own. Remember that sincere LOVE is one of the rarest of commodities in this fighting, squabbling, envious, fiercely competitive world of ours. Several years ago Reader's Digest magazine ran a magnificent article entitled "The Awesome Power of Human Love." It described case histories — based on hundreds of other similar cases — showing that only a half century ago the MAJORITY of infant children admitted to hospitals and children's institutions never emerged alive! Gradually, they found that if a young child were picked up, amused and "mothered" several times a day, his chances of survival were dramatically increased. The article concludes: "Scientists are today discovering that to live as if life and love were one is an indispensable condition — because this is the way of life which the innate nature of man demands." Yes, to live is to LOVE! And — within the guidelines expressed by the Ten Commandments — you can never give away too much love. The Proverbs state: "A merry heart doeth good like a medicine: but a broken spirit drieth the bones" (Prov. 17:22), This inspired statement shows the powerful effect of a happy, positive frame of mind not only on one's self, but on others as well. "A man that hath friends must sh5w himself friendly: and there is a friend that sticketh closer than a brother" (Prov. 18:24). To inspire love and loyalty in your friends and associates, GIVE of these qualities yourself in a spontaneous, wholehearted and sincere manner. This quality of outgoing interest and warmth toward others is the BASIS for the type of personal charm and magnetism we all desire. It is, of course, based on sincere LOVE toward God and fellowman — the kind of love that cannot be mimicked or "put on." So don't try to. But DO exercise the faith and cheerfully express the love you do feel — and go to Almighty God and ask Him for more! Learn to think of love and warmth as something you GIVE, not get. For, to quote a popular song, love is more real "when you GIVE it away." One of the most endearing qualities in a man — especially a leader — is the ability to see the humorous side of things, even about himself. Mr. Armstrong has told about one of the great American bank presidents he knew many years ago who had a sign hung up on the wall behind his desk proclaiming: "Don't take yourself too seriously!" This is excellent advice. For most men of ability are, alas, too busy building up and protecting their "image" or greatness and grandeur to maintain their childhood zest for small occasions and their ability to laugh at and enjoy many things in this temporal life — even themselves. A number of this world's outstanding leaders and statesmen have maintained the hearty zest and humor of younger days — and it has even increased their stature as leaders. Although many disagreed with his political theories, overwhelming millions of Americans were charmed and inspired by President Franklin D. Roosevelt's personality. When his rich, resonant voice came over the radio, "My fellow Americans... ," millions of his insecure countrymen were warmed and reassured. His full, vibrant laughter and engaging smile made him a popular companion even apart from his political life. One of his close associates and a counselor of many presidents, Bernard M. Baruch, describes his feelings after news came that President Roosevelt had died. "Now that the President was dead, I remembered with particular force his ZEST for living. He used to enjoy the pleasures of the children's hour... and the convivial conversation of his friends. "His sense of HUMOUR was always evident. I recalled many of the amusing messages he had sent me, such as the one I received when I turned seventy-three. "'Keep right at it,' he wired. 'Someday you will grow up.'" This flair for humor and occasional jokes also characterized Sir Winston Churchill. During the war, he wore a varied and obviously funny assortment of uniforms, hats and paraphernalia. Alan Moorehead wrote: "There was an immense love for Churchill in England through these years. The crowds knew every one of his uniforms and hats, his siren suits, the bow tie, the shoes with zip fasteners, the walking stick, the watch chain. Nothing apparently could ever weary them of the V-sign or the cigar, and the first sound of the grumpy, reassuring voice on the radio silenced all conversation in any pub or public place." Once, at the White House, President Roosevelt was wheeled into Churchill's room and found him, surprisingly, still drying himself after a bath. Roosevelt began to apologize and started to leave. But Churchill protested it was quite all right: "The Prime Minister of Great Britain has nothing to conceal from the President of the United States." So learn to laugh even at yourself — and at the many funny things that happen in life. Of course, always try to laugh with people, not at them. Learn also to preserve, or recapture, your youthful zest for the right kind of up-building fun and games — and for the new and different things and experiences that make life interesting! Perhaps the thing that irks others most about many so-called ('important" people is that they are so impressed with SELF that they seem blind to the needs and wishes of others. They are pompous and vain. They are impatient and demanding — cutting other people off in conversation and expecting superhuman efforts of their subordinates that even they themselves would not be able to accomplish. They utterly lack real compassion — the ability to share in the plans, hopes, dreams and sufferings of others. Like many a politician, they can put on a grand show in public — "demonstrating" by some pompous act or gesture that they care, after all, for the "common man." But, sooner or later, they get found out. For, as Abraham Lincoln is reputed to have said: "You can fool some of the people some of the time, but you cannot fool all the people all the time." Indeed, one of the characteristics which made Lincoln great was his sincere compassion for the slaves and downtrodden — plus his personal modesty and profound humility. Perhaps you have heard the story of the little old lady who was impatiently waiting outside her apartment house or hotel for a buggy to take her to the train station. Although the station was only a few blocks away, she had a large trunk too heavy even for an average man to want to carry for that distance. Finding her in distress — in fact almost at the point of tears over the prospect of missing her train — and with no buggy or help in sight, President Lincoln picked up the large trunk, placed it across his strong shoulders which had split so many rails back in Illinois, and said: "Follow me!" The little old lady, and her trunk, were personally placed on board the passenger train by the President of the United States — Abraham Lincoln! For a far greater example yet, it is very enlightening to read the life story of the greatest Personality of all times — looking as you read for the word "compassion." "And Jesus, moved with compassion, put forth his hand..." (Mark 1:41). "And when the Lord saw her, he had compassion on her..." (Luke 7:13). "But when he saw the multitudes, he was moved with compassion on them..." (Matt. 9:36). Genuine of out going concern for others — as Jesus had — will be expressed in hundreds of little ways. Tact, courtesy, consideration — we have many different names for such small attentions. Yet it is often through these acts of thoughtful kindness that we demonstrate to people the depth of our concern, our friendship and our love. Again, learn to "give" yourself' to others with sincere love and outgoing consideration for them. Have empathy — express compassion for them when they are suffering, or when they are down and out. Become more patient and tolerant of the mistakes of others - realizing your own human frailty. And be loyal to your friends and loved ones — not expediently "throwing them aside" when you think you have become "important." Do all this — and you will inspire the love, confidence and personal devotion of others in a manner that will enrich your life beyond measure. Strength of will and personality, infectious optimism and raw courage are qualities all of us admire. The greatest leaders and personalities of all time have had, at least in measure, these qualities. To be this way, you must, of course, have a purpose in which you fervently believe — and for which you are willing to die if necessary. Again, Churchill — the "Man of the Century" — is a moving example. In England's darkest days of the Second World War, he was constantly encouraging and uplifting the spirits of the British nation and the entire free world by his resolute conduct and his magnificent speeches. As President Kennedy stated: "He mobilized the English language and sent it into battle." In the critical period just after Dunkirk — when invasion by Hitler's legions seemed imminent — Churchill's ringing voice proclaimed to Britain and the world: "We shall not flag nor fail. We shall go on to the end. We shall fight in France, we shall fight in the seas and oceans... we shall defend our island whatever the cost may be. We shall fight on the beaches and landing grounds, we shall fight in the fields and in the streets, we shall fight in the hills... We shall NEVER surrender." Courageous? Indeed it was, under the circumstances. But more, the weight of sincerity and truth, the infectious optimism and confident manner, the unbounded determination and WILL to win — all these things lifted and inspired the British people so that this was, indeed, "their finest hour." The greatest examples of faith and courage are found in the Bible. In Acts 5:17-42 we read the account of the apostles of God being put in prison and threatened by the Jewish hierarchy of the time. The Jews had almost decided to kill them until Gamaliel, a wise counselor, spoke. "And to him they agreed: and when they had called the apostles, and BEATEN them, they COMMANDED that they should not speak in the name of Jesus, and let them go" (verse 40). After being threatened for their very lives — and their backs raw and bleeding from a cat-o'-nine-tails beating - you would certainly think they would at least slack off in their preaching, or perhaps go "underground." "And they departed from the presence of the council, REJOICING that they were counted worthy to suffer shame for his name. And DAILY in the temple, and in every house, they CEASED NOT to teach and preach Jesus Christ" (verses 41-42). They had absolute confidence in the LIVING God, and plenty of RAW COURAGE to go through the terrible trials and sufferings often necessary in His service. The man who has this type of courage and confidence, the man who is bold and SURE of his convictions, will inspire the admiration and respect of his friends and associates. Any real leader of men must have this bold power of decision, this sense of "captaincy" in storming the beaches of life, scaling the mountains and conquering all obstacles. Learn to cultivate and build courage and absolute confidence into your life! Practice these qualities when the little trials and tests come along — then it will become second nature to exercise them on the great occasions. Most important of all, surrender your life to your Creator and to His PURPOSE — then you can in faith ask Him for His strength, confidence and courage! No matter what his other faults, a person or a public speaker will always capture at least our momentary attention and interest if he has an abundance of just one quality — ENTHUSIASM. For if the poorest speaker in the world is on fire — completely GIVEN to his message — he is going to speak, gesture and perhaps shout with such ringing conviction and force as to wake up even the sleepiest audience. But most people seem only HALF ALIVE. They have no goal or purpose. They have lost their youthful zest for living and doing. They are often dull, boring and uninteresting. But the interesting person is lively and enthusiastic — and he usually makes life more interesting for others. 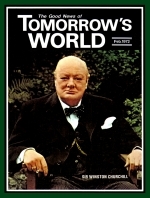 Discussing the colorful personality and zeal of Sir Winston Churchill, even in his private life, Bernard Baruch tells us: "I often wish people could look in on him as he walks through his garden with his dog, pausing to admire the beauty of a rose or to lecture the goldfish in the pond as he feeds them. I wish people could read the cables I have received from this master of English prose, cables in which he expressed his ENTHUSIASM over some development with a brisk '0 boy!' "
The very word "enthusiasm" comes from the Greek en theos, or "God in us." We often speak of one as being "inspired" in his cause if he portrays great enthusiasm. "Eloquence," said the great orator William Jennings Bryan, "may be defined as the speech of one who knows what he is talking about, and means what he says — it is thought on fire... Knowledge is of little use to the speaker without earnestness. Persuasive speech is from HEART to HEART, not from mind to mind." To sincerely be enthusiastic and driving ahead in all your activities, you must have a goal, or PURPOSE. So learn to set goals for yourself and cultivate enthusiastic DRIVE and ZEAL in all that you do. In your voice, your face and your actions, show that you are excited and thrilled about the opportunities and challenges of life. God says: "Whatsoever thy hand findeth to do, do it with thy might; for there is no work, nor device, nor knowledge, nor wisdom, in the grave, whither thou goest" (Eccl. 9:10). And in the New Testament, the Apostle Paul states: "And whatsoever ye do, do it heartily, as to the Lord..." (Colossians 3:23). So be zealous for those things that are right and good in this life, and put your whole BEING into seeking your Creator and HIS PURPOSE in giving you life and breath. Then you will REALLY have something to be "ENTHUSIASTIC" about! As His servant and His begotten son, become more outgoing and warm to all those about you; build zest and humor into your life; be patient, compassionate and modest toward your fellow human beings; with God's help become strong, confident and courageous; and finally, with God's supreme PURPOSE in mind, build drive and enthusiasm into all you think, say and do. DO these things! — and you will have a richer and happier life. You will extend additional happiness and courage to others, and you will have made great progress toward fulfilling the great purpose of your loving Creator.